China is both the world’s largest importer and exporter of electronic/ICT products. The abundance of low-skilled labour and manufacturing incentives has led to its heavy reliance on high-tech imports, which are then assembled, incorporated into end-products and finally exported. In absolute size, China accounts for more than 30% of global consumer elec­tronics exports, while consumer electronics as a percentage of national exports account for nearly 25%. According to the European IT observatory EITO, ICT sales growth in China has slowed down from 7.3% year-on-year in 2015 to 3.0% in 2016. In 2017 a 2.4% growth rate is forecast. This slowdown is due to China´s decreasing economic growth rates and increased economic uncertainty, higher market penetration and price competition. Decreasing sales in the PC and tablet market and the slowdown in the smartphone segment were compensated by technological innovations such as cloud computing, big data, and the Internet of Things. The continuing expansion of those emerging technologies should drive market expansion in the medium-term, together with income growth, enterprise modernisation and government support for the IT industry. 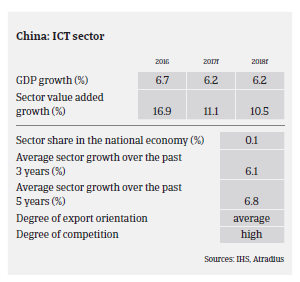 Despite on-going growth of the Chinese ICT market, challenges are increasing. For ICT manufacturers, competition is getting fiercer, as a large number of mainland Chinese enterprises have entered the component manufacturing industry in the past decade, causing price wars. At the same time, this segment is largely exposed to metal and oil price fluctuations. Another issue is increasing labour costs, as there have been regular and significant increases in the minimum wage payable in various provinces of China. Therefore, many ICT manufacturing facilities in China are facing difficulties when recruiting employees. In the ICT distribution/retail segment, requests to prolong payment terms and overdue payments have increased since the end of 2015. For traditional sales channels competition from the growing online sales segment is increasing, as online sellers can offer competitive prices and convenient in home shopping, and brick-and-mortar businesses suffer from costs for logistics and warehousing. Another issue is higher moral hazard during a market downturn as some players may bet on one-off deals to make big money and disappear from the sector afterwards. Retailers focused on selling foreign ICT brands are facing increasing downward pressure, given the Chinese government’s preference for local brands due to the national information security strategy (i.e. they may face barriers from some government-sponsored projects). 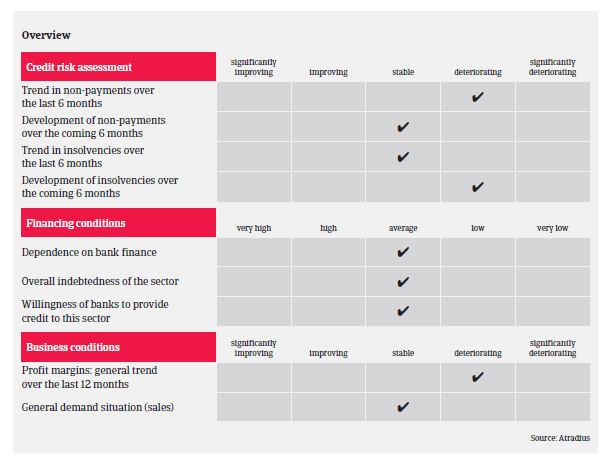 For the time being, our underwriting stance remains generally open for large ICT manufacturers and national/regional distributors, while we are more cautious with system integrators and online sellers, where competition is fierce and the financial situation of businesses is often weaker. Caution is also advised for private ICT distributors with one or two brands only, as the ICT market is a fast changing one, and such companies are exposed to elevated risks due to highly concentrated product portfolios. In all those segments we expect business insolvencies to increase in 2017. 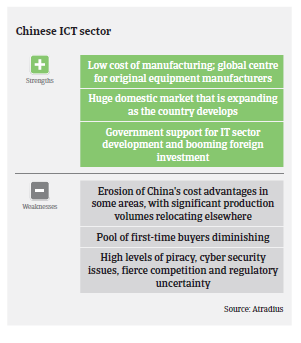 Transparency issues remain one of the main challenges in the Chinese ICT sector, as ownership of businesses and group structure are not always evident and there are often different sets of financials. Cross guarantees are widely used in bank lending to ICT traders, meaning that one company’s liquidity collapse could drag down others. At the same time, governmental actions (e.g. anti-corruption campaigns) can further complicate risk assessments.